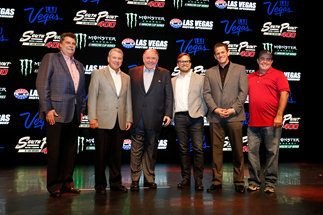 LAS VEGAS – The South Point Hotel, Casino and Spa has been named title sponsor of the September Monster Energy NASCAR Cup Series race at Las Vegas Motor Speedway (LVMS). The multi-year agreement will make the Michael Gaughan-owned property title sponsor of the South Point 400 beginning in 2018. The 267-lap race, set for Sunday, Sept. 16, will be the first in the 2018 Cup playoffs. A longtime off-road racer, Gaughan has been a motorsports enthusiast for decades, sponsoring races at LVMS since 1998 as well as race teams led by his son, Brendan, in the NASCAR Camping World Truck Series and NASCAR Xfinity Series through the years. The South Point 400 will be preceded by a NASCAR Camping World Truck Series race on Friday, Sept. 14, and a NASCAR Xfinity Series race on Saturday, Sept. 15. LVMS will be the first track in NASCAR history to host two tripleheader weekends in the same year. Special race weekend room and ticket packages are available at the South Point Hotel for fans planning on attending the September race, and they can lock in those deals on the casino’s website. LVMS’ first 2018 tripleheader weekend will consist of Stratosphere Pole Day and a NASCAR Camping World Truck Series race on Friday, March 2, the Boyd Gaming 300 NASCAR Xfinity Series race on Saturday, March 3, and the Pennzoil 400 presented by Jiffy Lube on Sunday, March 4. Race fans can buy tickets to both LVMS tripleheaders and capitalize on discounted prices by purchasing annual passes for all six NASCAR races. The track’s 2018 six-pack of events will show off a number of enhancements the track has planned for the coming months. Las Vegas Motor Speedway is a wholly owned subsidiary of Speedway Motorsports Inc. For more information about SMI, log on to www.SpeedwayMotorsports.com.